From chic boutonnieres to standout centerpieces, flowers bring romance, drama, color, and style to any celebration. Adapted from FRESH—Fresh Flowers...Fresh Arrangements...Fresh Ideas, by Sybil Brooke Sylvester © 2017, published by Glitterati Incorporated. Hints of blue tweedia peek through a palette of whites and greens. 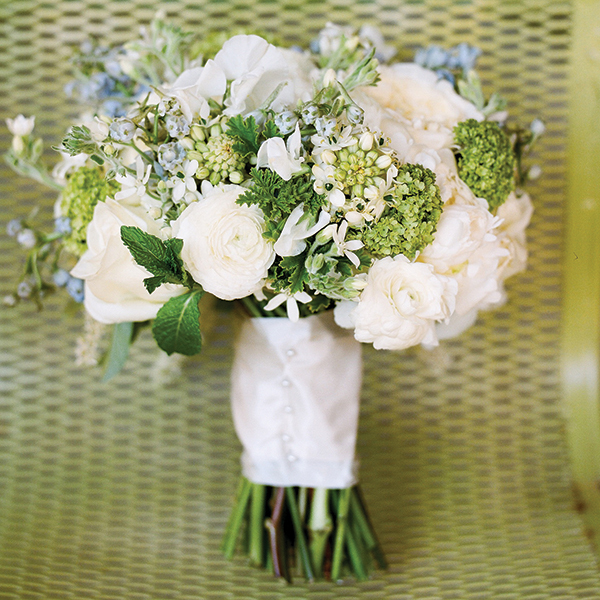 Ultra-feminine blooms are paired with rustic accents of vines and dusty miller. Deep ruby-red roses add drama to this springtime bouquet. Pinecones and fresh mint make unexpectedly chic accents. A boutonniere is trimmed with crisp gingham ribbon. A beloved member of the wedding. Flower girls await their moment wearing circlets of spray roses. A birdhouse is treated to big-day décor. A pretty maypole greets guests at a late-summer wedding. An autumnal entryway features sun flowers, apples and pumpkin drapery. Pretty in pink — and lavender, fuchsia, and green. A gilded étagère takes center stage in this winter tablescape. A tower of roses repose beneath a glass cloche. Vessels can be as much a part of the arrangement as the flowers themselves. Evergreens and gold ribbon perfectly befit a winter celebration. Garlands of succulents, roses and dahlias mark the pews at a barn wedding. A tiered cake is lavished with blooms. A floral-bedecked vintage car sends the couple on their new journey.